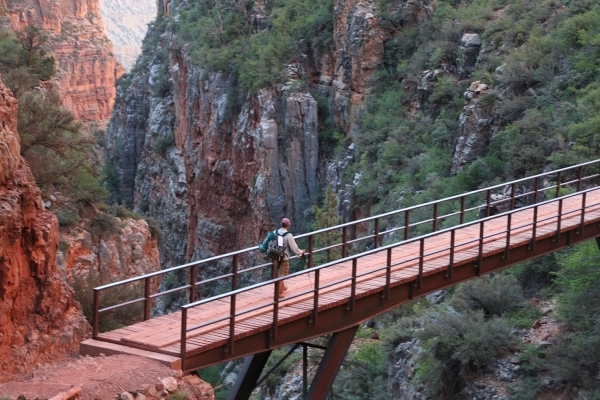 One of the epic adventures of the Southwest is hiking the Grand Canyon from rim to rim. This is a tough hike physically, and you’ll also need to get camping permits and arrange transportation, but the reward is one of the peak experiences of a lifetime. Good preparation is the key, as many people suffer in the canyon, every day, from ill planning and avoidable injuries. It may seem counterintuitive, in sweltering early August, to contemplate descending into an Arizona canyon, but you need to start those preparations now in order to hike in September or early October, or next year in mid-May or June, when the hike is at its prime. Approximately 24 miles long, this hike can be done in many ways. I would strongly recommend a multi-day camping excursion in the canyon itself and exploring some of the many side trails, such as to Roaring Springs and Ribbon Falls, along the way. I usually start from the North Rim because it is less crowded, with cooler temperatures, and I camp on the rim the night before and after the rim-to-rim hike. Leaving from the North Rim, you take the North Kaibab Trail, descending 4,480 feet over 14 miles down to Bright Angel Campground and Phantom Ranch, located beside the Colorado River. This makes an excellent place to camp if you have secured a permit, and at the ranch’s cantina, you can buy snacks and drinks. Even hot meals and picnic lunches are available if you reserve them well in advance. Once you leave the campground, you cross the Colorado River via the Silver Bridge, which takes you to the 9.5-mile Bright Angel Trail up to the South Rim. In the past, I have secured a camping permit at the Indian Garden Campground about halfway up this trail. 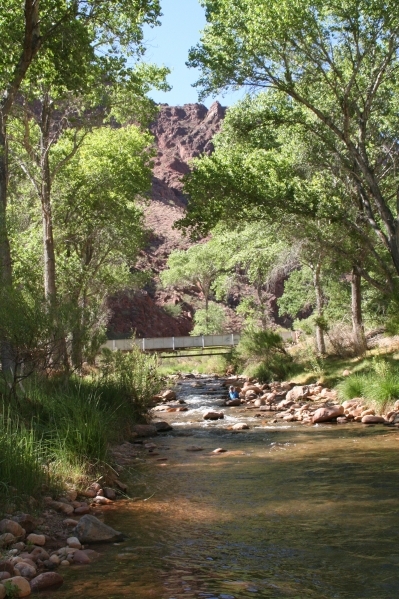 Here, you can take a dip in the creek and cool off, take in a ranger program and hike out to Plateau Point, a 3-mile round trip that’s ideal at sunset. From Indian Garden to the South Rim is about 4.8 miles with a 3,060-foot elevation gain. Start at dawn or earlier for this strenuous leg of the trip, as there is no shade. You’ll encounter quite a few hikers doing day trips from the rim. You’re also sure to encounter a mule train at some point descending the trail down to Phantom Ranch. When one comes along, be sure to stand off to the side of the trail until the entire group passes by. Once on the South Rim, many hikers take the Trans-Canyon Shuttle back to the North Rim and their vehicle. The shuttles pick up passengers at the Bright Angel Lodge on the South Rim and depart at 8 a.m. and 1:30 p.m., arriving back at the North Rim at 12:30 and 6 p.m., respectively. (If you’re hiking from the other direction, a southbound shuttle is also available.) This shuttle is available through Oct. 16, by reservation only; make them at trans-canyonshuttle.com or call 928-638-2820. Remember that the North Rim more or less goes into hibernation every winter, and services there, such as lodging, food and a general store, are available only through Oct. 15. Once it snows, the access road isn’t plowed, either. All hikers need to check in at the Backcountry Information Center (there is one on each rim) before starting a canyon hike to get up-to-date intelligence on trail conditions, construction detours and water availability. Make reservations for this trip as far in advance as you can manage. All information on obtaining back-country permits, fees, details on the North Kaibab Trail and Bright Angel Trail, and the campgrounds can be found at nps.gov/grca or by calling 928-638-7875. — Deborah Wall is the author of “Great Hikes, A Cerca Country Guide” and “Base Camp Las Vegas: Hiking the Southwestern States,” published by Stephens Press. She can be reached at deborabus@aol.com.